Leonardo brought depth to his pictures through the clever use colour. See how, through aerial perspective, he made distant objects look bluer and hazy. 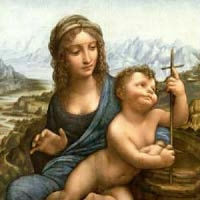 You may have noticed, as Leonardo did, that distant objects can appear blue and hazy during the daytime. He believed that this was because our atmosphere contains not just air but moisture and dust. (He had the good fortune to be around long before the invention of the motor car added enormous amounts of carbon to this mixture.) Leonardo reasoned, quite sensibly, that the further away an object is, the more this moisture and dust will be able to influence its appearance. This effect, called aerial perspective, occurs because the light colour of the mist produces blue colour against a dark background. This effect isn’t noticeable when an object is close to us, but as we move further away more skylight, which is essentially blue in colour, is added to the mix. This makes distant objects look bluer, and the further away from us they are, the bluer they will appear. The object will also appear to be less distinct. This happens not because aerial perspective blurs the image but because of the reduction in contrast that comes with each step we take away from the object.